I picked one up today and thought it played quite well. Not so sure on the Squire active pickups so I compared them to another guitar that had EMG (unknown models though). Squire sounded great actually. Got it home, change strings and set up the bridge. Plays even better now that the string action is corrected. Pickups sound great though the JP-2C, TC-100. Did not try it though my other amps. Some say it has a licensed Floyd Rose but doubt it. I did not remove it to see if it was an MIG, most likely it is an MIK due to the polished saddle blocks, German made Floyds usually have a granular surface as if it was a sand casting. The Sustain block also had the Big circled FR on it. All in black nickel finish. Frets were dressed properly so I did not have to work out any sharp points. The rose wood fretboard material has some really nice streaks in it. I am impressed with this guitar that cost just shy of $400.00 The reverse Fender Strat headstock looks good too. Workmanship is quite good. For a Polar wood body, it sounds damn good. I think I like it much better than the MIM Dave Murray strat. Probably because the Floyd is a full float on the squire vs resting against the body like the Dave Murray signature model. Have to say I am not much of a fan for Fender guitars but so far the two I now have may change that opinion. For a budget guitar, the Squire Contemporary Stratocaster is definitely great for the money. Love my Carvin Bolt C's just a bit more but those cost 5 times as much as the Squire. A good value for the money spent. I will post a picture of it when I get a chance to do so. 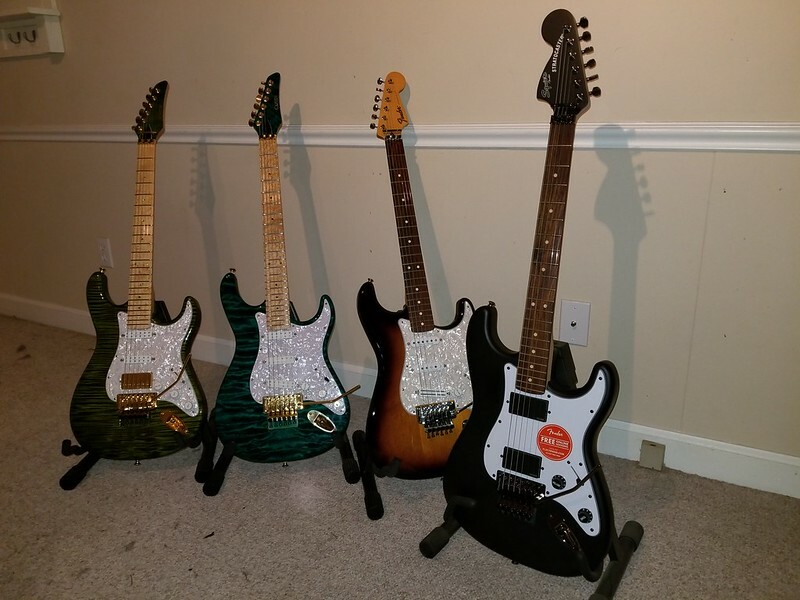 My Stratocaster styled guitars: From left to right, based on purchase price, the most expensive on the far left is a Carvin Bolt C, Black Limba body topped with flamed maple. Heavier than the rest but has a great tone similar to mahogany. Birdseye maple fretboard, medium jumbo stainless steel frets, 14inch neck radius, tung oiled maple/walnut neck. Sustain for days. Also my main axe in this category. Out of pocket (Custom order) was around $2,100. The teal green one next to it is a Bolt C I bought used on Ebay. Loved it so much I bought the Moss green one next to it. Paid around $750 and was worth every penny. Has a beautiful birdseye maple fretboard, medium jumbo stainless steel frets on a 10inch radius. Quilted maple over alder body. Gloss finished maple/walnut neck. Order cost would have been about the same as the moss green one, probably in the range of $1500 to $1800 at the time it was made. Has great sustain and has more of a strat tone to it. Both guitars are sporting Seymour Duncan pickups, Installed the "Every thing Axe" set in the teal guitar, opted for something different in the moss green. All of those pickups are the '78 bridge model. Yeah, bridge pickups in the neck and middle, may sound out of place but they sound great on that guitar in those locations. My very first Fender guitar (bought it after the Carvin guitars), MIM Dave Murray Stratocaster, paid $1024 but also bought an SKB case for it. Compound radius neck, fretboard looks more like Pau Ferro than rosewood. 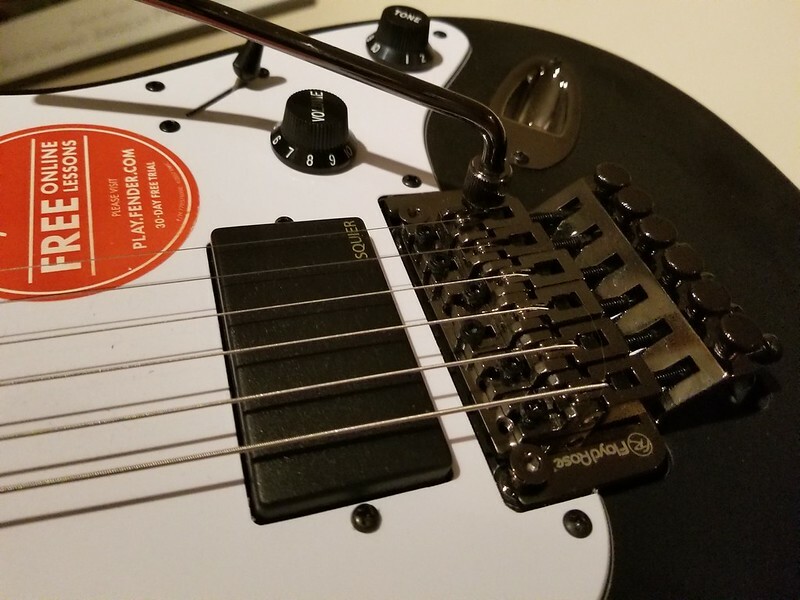 Medium jumbo frets, classic tuners (can be a pain but they work just fine), Floyd Rose rests on the body and does not float like the other three. I much prefer a floating Floyd over the body block setup. Changed the neck and middle pickups as I felt the hot rails and JB jr were a bit muddy in those positions. Still like the hot rails in the bridge position. I did have to polish the frets fresh out of the box as they seemed a little rough. Smooth as glass now. Now for the focus of this post, on the right is the Squire contemporary active Stratocaster. Has a 12 inch radius neck, medium jumbo frets ( or close to it). I am impressed that they were crowned and dressed properly. Guitar did not require any fret polishing or removal of sprouts. Not a single sharp edge to be found. Tung oil finished solid maple neck. Flat black and slippery painted poplar body. Yeah, this guitar could easily slip out of your hands. Painted Floyd Rose bridge (not black nickel as I stated earlier). The guitar felt quite comfortable in my hands, sounded good unplugged and even better plugged in once it was in tune. Only change I made to it was the strings and spring tension. It plays just as good as the other guitars in the picture. Active electronics are really nice too. I have no complaints about this instrument to think of. One last thing.... If you plan on getting one of these guitars to add to your collection or are on a budget and want a decent guitar to start off with, it will not fit the SBK case specifically design for a Fender Stratocaster. The reverse headstock is a bit larger than the traditional Fender Stratocaster. I have one of these cases and tried to see if it would fit, no go. I did get a $60 budget hard shell case for it that was meant as a universal style and it fits fine in that. Note the Squires do not come with the soft gig bag, that is ok as I am not overly fond of those. The Dave Murray signature model (MIM) Stratocaster did come with a gig bag. It is ok but I resolved that issue with the SKB case I bought to go with it. 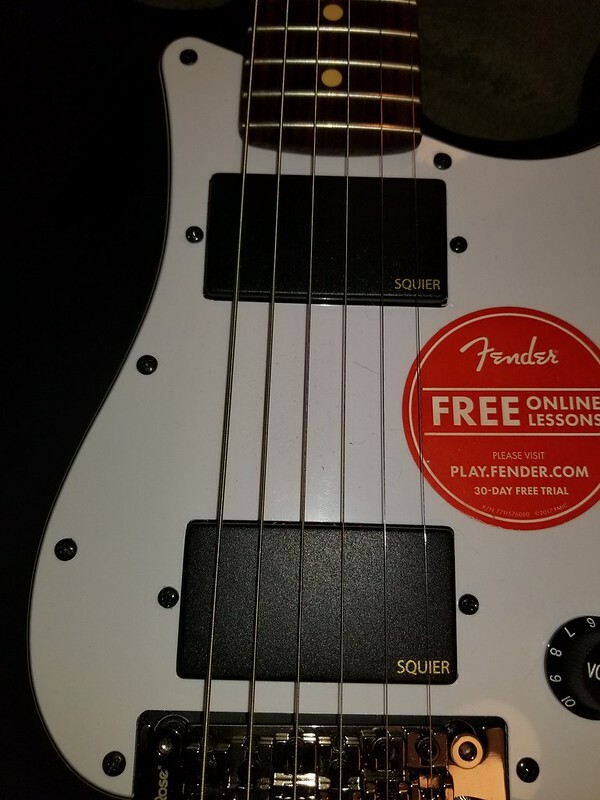 In comparison to my Nephews Squire he got a few years ago, other than the slightly lower cost of the instrument, I can definitely feel the difference in quality. I also compared this guitar to others of twice is retail value. Actually preferred it over the ESP guitar even though it had a decorative top wood and mahogany construction. I guess I got lucky with this one, it plays quite well for me. Not too heavy, slick finish on the neck just like my more expensive Carvin Bolt C. In the end, it is a decent guitar for the cost. There was another instrument I thought would have been of interest, it was a Schecter Damien model or similar as it was a used instrument for about the same cost as the Squire. Thought it has more of a plastic feel to it but it was a nice instrument for a beginner. End of line, if you are looking for a budget guitar just shy of $400, there is always the used rack for some bargains if you can find one, I would definitely look at the Squire Contemporary Active model as a comparative instrument in your quest. Well, the cost will go up on this one..... I removed the pick guard and found it has three pockets for pickups. The Squire actives are not all that bad but I feel that 400K pots are a bit overkill. Since it has a battery box, routed for three pickups, have the bridge finally setup for low string action. Guitar plays quite well for the cost. Since this one had the full recessed Floyd route, I will be converting this guitar to a David Gilmore with the EMG DG20 pickup set. Will have to swap the components onto a pick guard that is made to fit a Floyd. I was considering doing this to the Dave Murray MIM Stratocaster but since the Floyd does not have a pocket for full movement (rests on body) the Squire would be the best option. I could always resort to one of my Cavin guitars for the DG20 but I like them just as they are. Considering that I like the Squire, and it cost only $399, adding the DG20 at a cost of $329 it is a bargain compared to the David Gilmore Signature model ( a bit over $5k). Never though I was going to go down this path but it looks promising. Will have to check and see if some of my spare pickguards will fit the Squire before I get the DG20 set. One thing lead to another.... I was comparing the tube Fender products side by side. Of course I had to pull in my two Carvin Bolt C. I was comparing the un-plugged tone of each. I guess trying to decide which guitar will get the DG20 pickup set. The end result will be neither. I had grabbed one of the Carvin guitars and instantly realized why I love them so much. Stainless Steel Frets. That got me thinking about taking a different approach. Warmoth. Played around with the neck builder and then followed through with a body. Before I knew what I was doing, I wound up ordering a complete kit. This time the guitar body will be swamp ash with a recessed Floyd Rose pocket, SSS arrangement and a battery box route on the back side of the guitar. I opted for the compound radius neck, stainless fret wire 6150, Ebony board and a flamed maple shaft wood. Should be interesting when the parts come in. I should have ordered the shims from StewMac but I did not this time. Had to get tuners. I would have gone the Kiesel route but the prices have gone up. The Squire will remain as is. I may end up replacing the electronics down the road with EMG 57/66 set. DG20 pickup set arrived, just waiting for the other parts to come in. What's old is new again sometimes. I've been playing my Steinberger guitars exclusively for two years until I pulled out my old Jackson RR that sat unused for 20 years as I rolled through Les Pauls, stratocasters, etc. Now I play the Jackson most of the time. I had the Jackson custom made with ss frets, one pick-up, one volume and an attitude. It is as if I just got the guitar! The necks are similar on both guitars which is a good thing IMO. Yeah, it is always great to open up a case and find an old friend waiting for some use. I have to cycle my instruments so when I am in the mood to play something, I typically use what is out. As for the Squire, it took me a bit of looking into and deiced to go with plan b. I still like the humbucker arrangement but wanted something a bit different than the stock electronics. I basically have to turn the volume control all the way off. Not sure if it is related to the pot values or not. The stock pickups are not bad at all, really. But I opted for the EMG 57/67 set, new pickguard with three control holes, may do a volume + volume + master tone, or master volume + tone + tone. All of the parts except for the 3way switch come in the set so I can easily swap out the controls. I do like the guitar for what it is. I was also taking interest in the MIM Strat, sounds great, plays great but not fond of the blocked tremolo. It can dive but that is all. 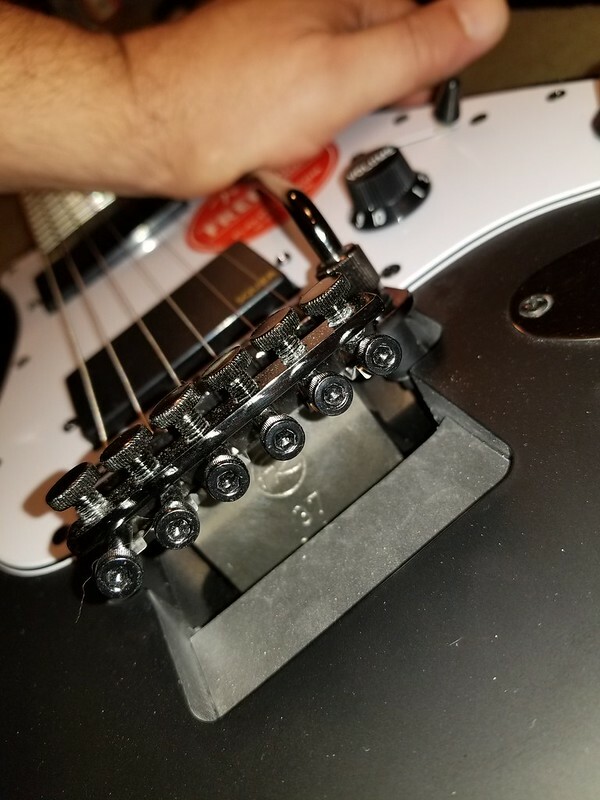 Ordered some shims from StewMac to increase the neck angle so I can adjust the Floyd so it floats and not anchored to the body. It does have its benefits though, hard string bends does not seem to move the trem much so noting goes out of tune like it would with a floating bridge. Though about routing out the body where the shim extends down as this is part of the sustain block and tuner spring assembly. Will see what I can get with the shims. 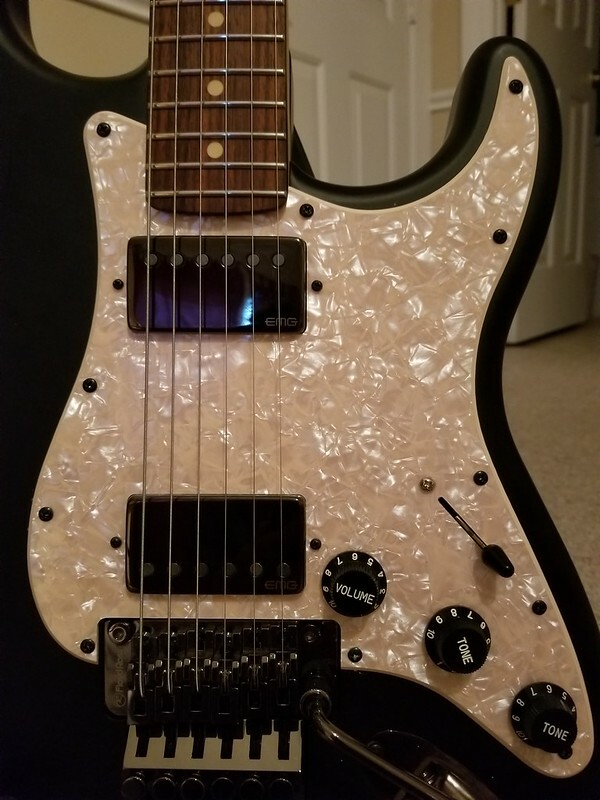 While I am waiting for the Warmoth Strat build to be completed and shipped out, I have been considering some upgrades to the Squire as well as the Dave Murray Stratocaster. For the squire, the electronics and pickguard will be replaced as I described with the EMG 57/66 set. Since it has the Floyd Rose bridge fully routed there is not much concern with that guitar on sustain and tone qualities. It sounds as good as poplar will get. The current active pickups are not bad but feel the volume and tone pots are too high in value such that there is not much usable tone control. They sound ok but I think the EMG will have a better overall performance. On to the Dave Murray MIM Stratocaster. What I do not like about the guitar is the way the bridge is set up. I am so used to a floating Floyd Rose that I find the Dave Murray set up to be less than desirable. It is a nice guitar but having the bridge resting against the body such that the shim for the sustain block places an upward angle on the bridge and the strings to not sit in the saddles in their desired location. Ideally the bridge plate should be parallel to the body at rest or its tuned position. Since I did not do such a good job cleaning off the frets as there were some minor file marks present on the frets I was still getting that gritty feeling on some frets. While shopping for parts I found some wooden neck shims, and ordered the three piece set (0.25, 0.5 and 1 degree). To finish off the frets I got a set of the fret erasers and the stainless steel fretboard protectors. The frets were not all that bad to start with after I polished them the first time. 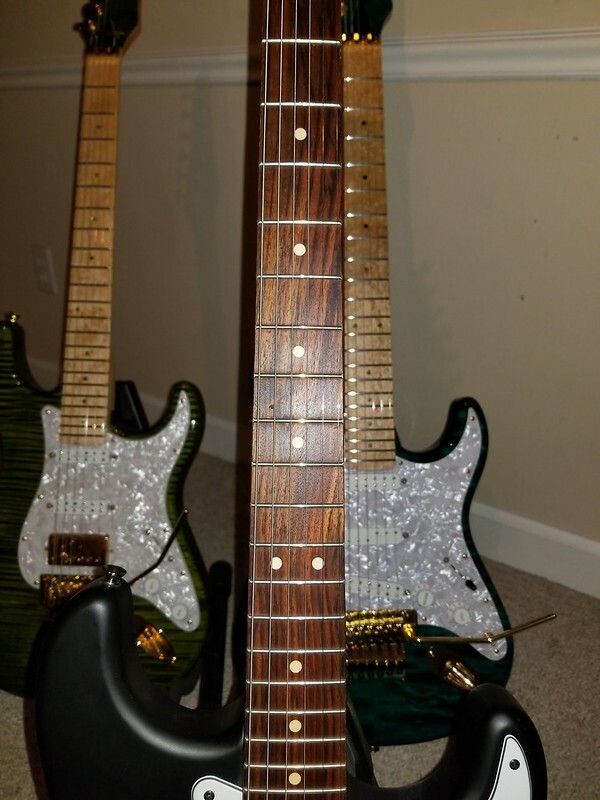 Before I started on the Dave Murray guitar I wore out my fingers polishing up some Gold Evo frets on a Kiesel I bought used. That instrument was in dire need of TLC. Also found the Floyd nut was loose and the truss rod was not properly setup. That guitar was almost in need of a crown job as it had a few flat spots worn in. The Fret erasures did a good job at rounding off the fret wire and the end result was smooth as glass, almost as sweet as stainless steel frets. I did get around to making changes to the Dave Murray Stratocaster. Removed the neck and saw the micro angle adjustment grub screw. Not too savvy on using that as it changes the neck contact points to the front edge of the neck pocket and the rear center of the heel. Not to mention improper screw tension on the two rear neck screws. Novel idea but not very effective. My goal was to improve sustain as well as provide more of a floating bridge setup. I started with the 1 degree neck shim after I finished the fine polishing of the frets. Set the string action and tightened the springs and installed the remaining strings (I used the two E strings for gauging the string offset from the fretboard). With the 1 degree neck shim installed, I placed my neck gauge straight edge on the frets and extended it to the bridge. The change in height was a little over 1/8 of an inch plus the string offset. I would not go any larger than a 1 degree shim as this will provide enough offset for a Floyd Rose setup that is fully floating, and has as much travel as a recessed Floyd Rose route. Also I have the bridge pickup as far up as it will go. I had concern the offset of the bridge from the body would be a comfort issue, to be honest, I did not even notice the difference. I may end up trying a different neck angle, perhaps 0.75 degrees using the 0.25 and 0.5 shims. I will give the 1 degree neck angle some time to grown on me. I may have to use the 0.25degree shim on the Squire Stratocaster as it appears the neck angles in the opposite direction and I have the Floyd Rose buried into its pocket. I will have to measure the current angle and see if the 0.25 would do the trick. For the Warmoth build, I could not wait so I already transfered the DG20 components to the new pickguard as the warmoth build will have a Floyd Rose. I am having fun...not actually doing much with music but working on the instruments is something I have not done in a long time. I may not be an expert and lack the proper tools to work a neck properly, perhaps it is something I should consider getting back into again. Erlewine Neck Jig Workstation will cost as much as a cheep guitar if not a little more. Do need it or will I make use of it? 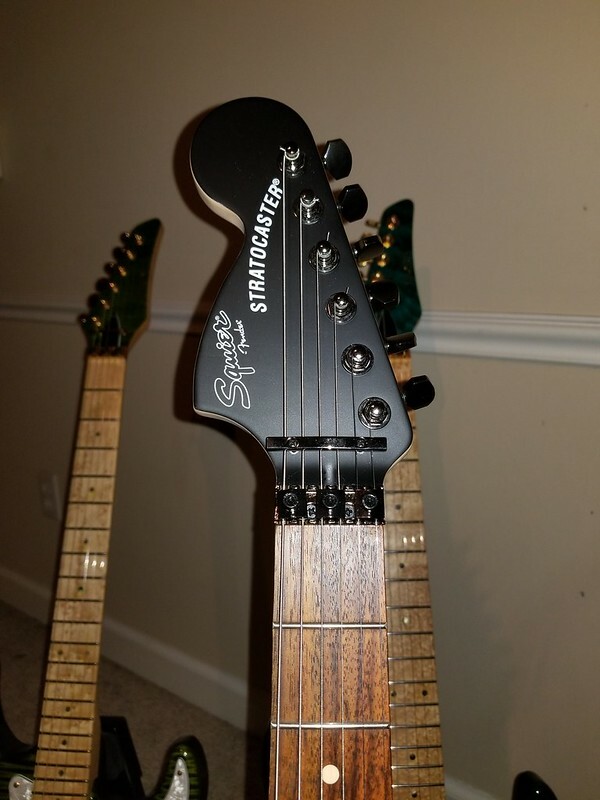 I do understand there is some work needed to prep the Warmoth neck so I may just pay someone to do this for me..... Will have to see how things turn out, may not need to do this after all. I did make some changes to the Squire strat. Felt the active pickups were ok but the volume and tone pots were not ideal. Also they grounded the strings on the spring claw. I updated the pickguard to match the inlay dots on the fretboard but not a solid crème color, more of a vintage pearl as it has white flakes embedded in the cream plastic. Also replaced the electronics with EMG F-55/67 set. Had to order direct for the Fender or Floyd Rose pole spacing on for the bridge pickup. While I had the strings off the guitar I buffed out the frets as I did find some rough spots past the 12 fret. Overall not much polishing was required as they were in great condition. Bought the pickguard from Warmoth made with a Floyd Route. Yep, if fit perfectly except for two screw holes. Had to drill one and the other was a bit offset that was not big deal. All set up and this guitar plays perfectly. Instead of just a volume and tone pot, I opted to use one volume and two tone pots. I can change that later on if I feel I want a second volume control vs having two tone controls as the EMG set came with 2 controls for each pickup. Had to order the 3 way switch from EMG as the one on the Squire was ok but not as good as the Oak swtich that Fender uses as well as what comes in the Emerson tone kit. EMG has the circuit board mounted so that was much easier than using the small board with the Velcro tape. Had to solder 4 wires though, no big deal. Battery box wires and the three signal wires used by the EMG (Tip, Ring, Sleeve) Ring is batter ground and the sleeve is the signal ground. The upgrade definitely made this guitar worth while. Plays great and sounds awesome. The EMG pickups are way better than the stock Squire Actives. I did the same with the DG20 pickup set, transferred all of the parts to a new pickguard. Still waiting on the guitar parts to be finished. Looking forward to building it actually.